There are many reasons IT projects go off the rails or fail, but one of the most common is the behaviour of the people working on them. Over the past decade spent rescuing troubled projects, we’ve identified six different group behavioural patterns that are common in successful, failed and reformed projects. Understanding these behaviours and finding ways to recognise and expose them has been transformative in our line of work. But as large, high-profile IT projects continue to run into difficulties, we believe others might also find value in our methodology. We refer to the behaviours as peak performance attributes and we consider them to be the six essential characteristics of a peak performing project team. We further divide the six attributes into two key areas, which we call business solution clarity and capability to execute. However, all six are considered predictive of project success. Within business solution clarity, the three key peak performance attributes we look for in a project team are clarity of purpose, balance and alliance. Clarity of purpose is as it sounds. Is everybody clear about the purpose of the project? And not only are they saying the right thing but are they acting in a unified way? This is a very important measure when a project involves multiple internal groups as well as third-party resources from big suppliers. Balance is another important attribute in the project ecosystem – that is, among the project team, suppliers, business stakeholders, executives and the customer. All have to work in unison to achieve the project’s outcomes, and so balance is the ability of the ecosystem to trade off often-conflicting performance metrics of budget, schedule and solution quality or business outcome. It’s very common in these projects to get different answers from different people, based on their own weighting of these trade-offs. A CFO may weight meeting budget higher than time or solution outcomes, whereas the business stakeholders may have a far greater focus on the solution quality rather then time or money.The reality is that to be successful, the project ecosystem has got to be able to efficiently trade those different factors off as a whole. Alliance is characterised by a shared commitment and shared risks to operate as a unified temporary organisation for the business outcome. What happens when a project becomes stressed: are key suppliers as worried about the project risk profile as much as their own commercial risk profile? As soon as subgroups put their own risk agenda before the program’s risk agenda, the ecosystem starts to pull apart. Successful projects are unified and all pull in the same direction. The other three characteristics – drive, certainty, and effectiveness – are all indicators of the project ecosystem’s capability to execute. Drive is a measure of the group’s forward momentum on the project and their ability to quickly make and hold key decisions and overcome any issues that may crop up; certainty is about the group’s ability to effectively manage project risks; and effectiveness is a measure of the group’s ability to employ structured project management techniques to deliver project outcomes. When we come across troubled projects, underperformance on any of these six characteristics is typically not a recent phenomenon that has caused the project to become derailed. Rather, low performance on these key attributes can be traced back to project inception. Often, the project is set up and structured poorly – there may not be adequate role clarity, or the disciplines for managing the project are poor. It then becomes a chicken and egg problem: the poor structure causes poor behaviour, and poor behaviour then prevents the structure from being fixed. Over the years we have codified recognition of the six group behaviours and used machine learning both to more quickly recognise variations in successful patterns of behaviour and to predict where they might lead if left unchecked. Each time we measure peak performance attributes of the group, our tool learns from them and improves its ability to predict whether a project is going to be successful or fail. We have recently launched a new tool TeamAmp, that is part of our AI Assurance Suite that embodies our methodology and offers projects the ability to measure, monitor and manage these key performance attributes right from project commencement. Time and again, we have found the human overseers of projects need help getting to grips with people problems. People are a very complex factor to measure and understand, and computers are well suited to this kind of behavioural pattern recognition. In our more than ten years making projects right, the absence of specific project management methodologies and measures for people is clear. There are plenty of approaches to defining and measuring a schedule, defining and measuring a budget, designing, building and testing code. But what we found was it was the way people behaved and aligned, what they were focused on and how they managed risks jointly that really mattered to a project’s success or failure. Hills Limited (ASX:HIL) is a value added distributor of technologies that ‘connect, entertain and secure people’s lives’ with turnover approaching $280Mill. It has built up a strong presence in the security, audio-visual, communications and health markets. Like many large companies, Hills saw an opportunity to digitally transform its operations and become more customer-centric in order to drive new growth opportunities. “Hills believes the e-commerce platform will allow staff to be more engaged with customers and vendors, and create a stronger platform to promote vendor products”. However, as with other organisations that choose to tackle digital transformation, Hills knew it would encounter challenges along its journey that would threaten the success of the project and had not attempted a project of this complexity for many years. As a result and following a board-lead initiative, Hills decided to deploy an innovative assurance approach using an artificial intelligence (AI) service by Certus3. It selected TeamAmp, an innovative, lean ICT project assurance system developed by Certus3, to keep the project on track right through to its successful delivery and provide predictive measures of success which could be reviewed at any moment in time thereby avoiding potential pitfalls such as late delivery or budget blowouts. Certus3 is Australia’s leading provider of independent specialist ICT assurance services. Its AI enabled tools and services have become critical to running healthy, complex IT transformation projects, providing quick, accurate, bias-free, systematic measurements and actionable diagnosis of challenges before they can adversely impact the delivery schedule or outcomes. TeamAmp is the first use of machine learning to enable executives to continuously monitor and improve the people (behavioural) characteristics of a project that are predictive of success or failure. Certus3 have also created an expert system that supports TeamAmp by enabling clients to precisely measure the risk profile of their project and define a specific improvement or reform plan. Hills used the TeamAmp system at key milestones during the e-commerce implementation program to drive improvements in team performance and ensure people remained aligned to the common goal. It was also able to provide executives with unique insights into any areas of concern that enabled them to proactively guide and lead the project team to success. This also gave comfort to the Board given that this was a multi-million dollar project. On a practical level, rather than using external consultants to run health check services, the project team was periodically sent a carefully designed, multiple choice digital survey that took less than 10 minutes to complete, ensuring it did not disrupt the team delivering the new platform. All through the transformation program, the internal team at Hills were in control and were able to gather data and produce results through the online platform with no human intervention. As a result, the new e-commerce platform went live on schedule in February 2018. Chief Financial Officer, Chris Jacka, who sponsored the e-commerce program, says TeamAmp helped guide the program to success. “There is no other way you can get this kind of analysis from the 40+ people involved in a program regularly and provided a clear value for money solution for our project team ” Jacka says. The TeamAmp system also gave confidence to the Board and executives that the project would deliver the stated outcomes. Non-Executive Director, Philip Bullock AO, strongly supported the use of TeamAmp for this project, based upon his industry experience built up over 20 years at IBM and the benefits he had witnessed elsewhere. “Almost 40-50% of all technology based projects are late or over budget1. As a Board, we needed to ensure that the governance processes gave us the best chance of success. Certus3, via their TeamAmp, which has been developed over 8 years, gave us a level of comfort that we could deliver a critical project for the future success of Hills” Bullock commented. Hills CEO and Managing Director, David Lenz, says TeamAmp “gave us a very clear insight into areas of concern” during the e-commerce platform delivery, “which resulted in us addressing those areas immediately. This was very beneficial for Hills and allowed us to move forward with the project. “Through the use of a specialist assurance company we have been able to get a deeper understanding of the issues affecting people in a transparent way,” Lenz says. Hills is now embarking on yet another transformational initiative to upgrade its enterprise resource planning (ERP) to better position the company to support growth. Based on the success of stage one of the digital transformation, it is planned that TeamAmp will be used to provide assurance around the delivery of the ERP work. Certus3’s new AI Assurance Suite supports traditional, agile and hybrid project management governance approaches and is an alternative to expensive consultant-lead health checks or assurance. Certus3, an Australian services company which partners with organisations to assure large-scale and complex transformation programs, has launched its next generation of Artificial Intelligence (AI) enabled solutions. TeamAmp and SolutionAmp give companies the data they need to confidently manage digital transformations to success. Traditionally, most organisations have used standard project management and governance processes to assess the ongoing status of their projects with some supporting this with internal or external reviews or assurance of the projects. In both scenarios, the organisations use measures and approaches that have not materially evolved in the last 20 years and are unreliable and highly variable in terms of quality and outcome. At the same time, organisations are heavily dependent on the people involved in the reviews or assurance and are very prone to being influenced by organisational culture, politics and biases. They also look at lagging indicators, including schedule and budget as measures of progress and success and usually fail to look at leading predictive indicators of project success. By the time project issues surface in schedule and budget overruns, the leading indicators would have identified problems affecting performance for many months if not years. Certus3’s new AI Assurance Suite supports traditional, agile and hybrid project management governance approaches and is an alternative to expensive consultant-lead health checks or assurance. It changes how project assurance is delivered and does this at a lower cost while placing control in the client’s hands. At the same time, it improves the effectiveness of assurance by measuring the predictive characteristics of success enabling organisations to take improvement action early. Certus3’s new artificial intelligence based suite includes TeamAmp, a world first cognitive platform that enables companies to measure, monitor and manage people and how they are performing together. Its machine learning technology benchmarks a team’s behaviour to optimise their performance and then supports sustaining that high performance for the life of the transformation. TeamAmp uses the data gathered from a company’s project ecosystem and calculates a project’s success according to six key attributes of high performance and then provides an overall Team performance Score. These attributes include Clarity of Purpose, Balance, Alliance, Drive, Certainty and Effectiveness. These attribute scores determine the heath of a project, the probability of success and what actions need to be taken to improve performance and chance of success. In addition, SolutionAmp, part of Certus3’s new AI Assurance Suite, is a diagnostic expert system that delivers a rapid project risk profile and powerful action plans. For example, a construction company implementing a compliance platform as part of a health and safety program must have a program with a clearly defined set of functions. At the same time, it needs to ensure safety compliance, monitoring and adherence to safety protocols that prevent injuries and save lives. At each stage of the project lifecycle the business leaders must assess that the solution being built will meet the stated objectives and provide the return on investment that is required. SolutionAmp can guide the assessment of project milestones and control points to determine if the right level of certainty has been achieved and, if not, what needs to be done. It provides business leaders with a precise measure of actual versus target certainty progress, what the gaps are and how best to close them. Certus3 is an Australian assurance services company which works with clients undergoing IT transformation programs to diagnose issues quickly and accurately and subsequently provide clear insight into recommended approaches for improvement. Certus3 believes that every business today is a digital business. 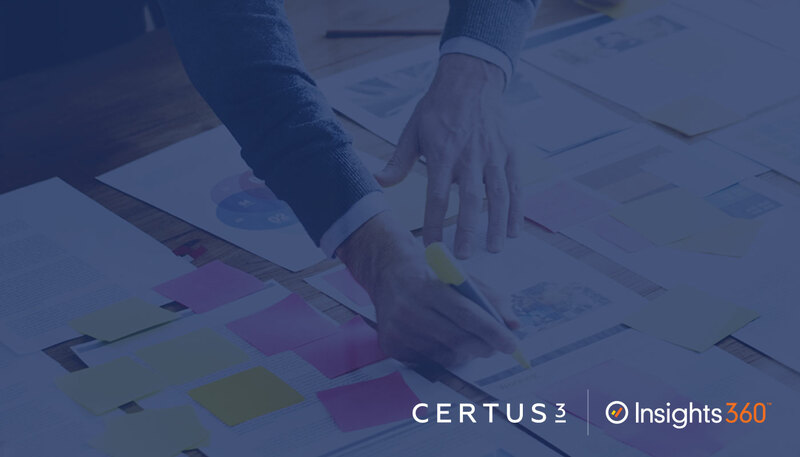 As a result, its assurance solutions combine people, insight, and technology, enabling Certus3 customers to realise the full potential of their ongoing transformation programs. Certus3 achieves client success through its locally developed machine learning and expert system software solutions. Current clients include Asciano, Hills Industries, Myer, News Corp, Masters, NAB, Perpetual, Telstra, Toll Holdings and Woolworths. Certus3 hosted its inaugural Mid Year Event on Thursday, 8 August at Crown Street’s Winery. The event was celebrated by the current Certus3 team all of whom enjoyed a fabulous feast and some lively conversation. From March each year through to the end of the financial year, we typically see an increase in the number of calls from CEOs and Executive teams as they move through their annual strategic planning processes. We love these conversations: it’s great to hear how so many different organisations have been progressing over the year, and to learn about their plans for the next one. With information technology underpinning so many of our business processes these days, it’s not surprising that many of these plans involve major IT infrastructure changes. But establishing highly trained IT teams is only half the equation: we have seen time and time again how important it is to closely integrate IT infrastructure changes with business strategy changes so that your organisation’s overall performance improves. If IT system changes aren’t closely integrated with a business’s strategic and operational plans, quality will slip and costs will go up, neither of which any business wants. Over the years, we’ve partnered with all kinds of organisations that are accredited with best practice IT support frameworks such as ITIL, the Information Technology Infrastructure Library framework created by the British government in the late-1980s to increase the quality of government IT services while managing the overall costs of delivering those services. If your organisation is a practitioner of ITIL, you’ll know just how much impact introducing best practice IT approaches such as accountability, consistency and clear boundaries can have on the bottom line. When processes are standardised and staff know what they are accountable for, the quality of service improves, customer satisfaction increases, and repeat business and referrals go up. All of which is great for business! But as we also know, introducing any kind of change, even if it is a best practice approach, requires careful planning and transitioning so it is accepted across the organisation. Of course the creation of the right structure is only one half of the ITIL equation – as with every major transformative change the ability of the organisation to adapt to the new structure is the defining factor of implementation success. In order to gain the maximum acceptance of the benefits a fair bit of effort needs to be focused on preparing the organisation’s people. Certus3’s Business Transition Team has worked with many clients to make the transition from current to future state as smooth as possible – Mel Young, our Business Transition Practice Lead, never ceases to emphasise the importance of defining and articulating the changes to the individuals impacted by the introduction of an ITIL framework. Not only does ITIL introduce new IT support processes but it brings with it newly defined roles and responsibilities for individuals – which require a fair bit of getting used to. So if your organisation is accredited with ITIL or a similar IT best practice framework, contact us at Certus3 today and find out how we can help you successfully prepare your people and integrate your IT infrastructure changes into your business so you can stay ahead of the pack: +61 2 9238 2131, www.certus3.com. [i] Scarborough, Michael, ‘Why ITIL is important’, http://www.globalknowledge.ie/content/files/documents/white-papers/itil/WP_IL_Why_ITIL_Is_Important.pdf, accessed 14 June 2016. An actively engaged Executive Sponsor is the key to program success, so why are more and more programs going without this essential senior-level advocate? Recent research by the Boston Consulting Group and the Project Management Institute indicates that fewer than two thirds of programs have assigned Executive Sponsors, resulting in significant losses for organisations globally. It’s not all bad news however. There are simple solutions to arrest this trend and to boost the effectiveness of this central role. We all struggle with multi-tasking and have experienced the pain associated with missing appointments or losing sleep when attempting to spread oneself too thin. The same can be said for Executive Sponsors who, in attempting to be across it all, end up missing important details impacting the very initiative they are responsible for delivering. Solution: Eliminate the over-assignment of sponsorship responsibility. Effective and correct communication above and below the Executive Sponsor is vital. Information when conducted via the Executive Sponsor is used as means of influence in the alignment of stakeholders, as a means to confirm leadership (knowledge is power) and is used as a platform for organisational decision-making. Conversely, communication that is provided to the Executive Sponsor from the program via the program manager is also crucially important. This information usually takes the form of regular progress status reports calibrated to the appropriate level of detail for the Executive Sponsor. This logical approach to the design and delivery of program status reporting is more often than not lacking, with already overstretched Executive Sponsors commonly overburdened with unstructured, detail-heavy content. Inaccurate status reporting provides yet another more overt cause for Executive Sponsor concern. This is particularly apparent when faced with a program whose status has suddenly shifted from green to red with little or no warning. Such a predicament can and should be avoided. Certus3’s Insights360 tool provides Executive Sponsors, and other senior leaders, with a low impact, cost-effective means through which the ‘true’ status of a project can be quickly understood. The tool not only provides a platform for reporting but more importantly is able to identify key problem or success areas – just in case an adjustment is required. the Executive Sponsor should have access to an independent reporting tool which can be used periodically to check the ‘true’ program status against the reported status. Most Executive Sponsors are not program professionals and therefore need specialist support and guidance when charged with the responsibility of large-scale transformation programs. Although on-the-job training is the most common way for Executive Sponsors to acquire knowledge and skills, better project outcomes are achieved when organisations invest in the professional development of their Executive Sponsors. Solution: Create and offer formal Executive Sponsor development programs, which include access to mentoring from experienced Executive Sponsors. According to the research as much as US$109 million is wasted for every US$1 billion spent on programs due to ineffective Executive Sponsorship. By eliminating or reducing the factors that limit Executive Sponsor performance this waste can be prevented.